When someone has a reaction to things in the environment that are harmless for most other people, the person is having a “hypersensitivity” reaction. An allergy occurs when the person’s immune system is causing this reaction. A hypersensitivity reaction which does not involve the immune system, but in which other mechanisms such as an enzyme deficiency are responsible, is sometimes called an “intolerance”. Food intolerances are sometimes incorrectly called an allergy when in fact it is not an allergy. Allergens are substances to which you are allergic. When allergic people are exposed to allergens they can develop an allergic reaction that releases chemicals into their blood that cause inflammation (redness and swelling) and allergic symptoms. The second step happens when the pollen enters the person’s body for a second time. The pollen comes into contact with those IgE antibodies stuck onto the side of the allergy cells. This makes the allergy cell burst and release its chemicals into the blood. One of the more important chemicals is histamine. It also causes a longer-lasting build-up of allergy cells called “inflammation” that causes swelling of the parts of the body involved. Inflammation is very irritating and uncomfortable and can damage those parts of the body e.g. the nose. It is really important that people with allergy have tests done before any advice is given about avoiding specific triggers. Many people have non-specific irritant triggers … people with hayfever react to cigarette smoke and very cold air and people with eczema react to heat, soap and rough fabrics. But allergy triggers differ from patient to patient. There is no “one size fits all” list of triggers for people with allergy! This is why skin tests or IgE blood tests need to be done so that triggers can be identified and avoided or to consider immunotherapy. The first step is for the doctor to hear all the details about what you were exposed to and exactly what reactions occurred. This will help indicate whether the reaction was an allergy or not and if it was an allergy, what kind of reaction it was and whether it was mild or severe. 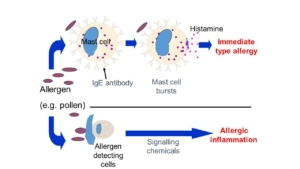 Allergies are divided into immediate type (IgE mediated) reactions, where the main problem is the release of chemicals from the mast cells when they burst. Delayed type (non IgE mediated) reactions take longer to build up and the main problem is the “inflammation” swelling and damage to the parts of the body involved. There are 2 main tests that can be done for immediate reactions: skin prick tests and ImmunoCAP blood tests. These tests show the presence of the IgE antibodies. If these tests are negative an immediate type allergy is almost always ruled out. Because the tests show the specific allergy antibody, they will start to be reactive (more than zero) when the person is sensitised (see above). A test that is “reactive” does not automatically mean that the person is allergic, it means the person has the potential to be allergic! The larger / higher the reaction is, the more likely it is that the person is truly allergic to that allergen rather than just being sensitised. The results of the test must be carefully compared with levels that have been shown to be truly positive, rather than just a little raised (reactive). In some cases the test cannot give the final answer and other tests may need to be done. Allergy tests are a guide to whether the person has the potential to be allergic but they do not predict whether the reaction will be mild or severe. SPTs use your own body to show us whether it has IgE antibodies to the allergens in the skin prick drops. SPT are used to diagnose both allergies in the air (that cause hay fever or asthma symptoms) as well as to allergens in foods. 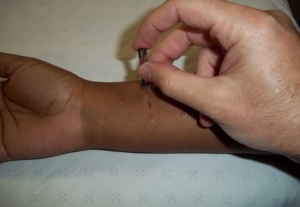 A skin prick test can be performed easily in an allergy clinic (see skin prick testing). If you/your child is taking antihistamine tablets or syrup they need to be stopped 3-5 days before the allergy skin test is done as they may interfere with the test. The SPT is performed by placing a drop of the allergen on the skin. A lancet is then used to prick the drop through the top layer of the skin so that the allergen is introduced under the skin surface. The drop is then wiped away. This process is repeated for each allergen requiring testing. After 15 minutes we look at the skin for signs of a reaction. A negative reaction is when the skin remains normal. If we see a white wheal (also sometimes called a hive; a bump similar to that seen in an insect bite) surrounded by redness (also known as ‘flare’) we measure it to see how large the reaction is. The larger the reaction is, the more likely it is that the person is truly allergic to that allergen rather than just being sensitised. The second test is called an ImmunoCAP® and involves blood being taken from the patient. The ImmunoCAP test directly looks for the IgE antibodies to specific allergens in the blood. It therefore also shows sensitisation … the potential to have allergy, not the presence of allergy itself. The higher the ImmunoCAP result is, the more likely it is that the person is truly allergic to that allergen rather than just being sensitised. The blood test is useful because it can be done even when the person has recently had antihistamines. Adults and children of any age can take an allergy blood test. ImmunoCAP tests are available for hundreds of individual (specific) allergens … grass and tree pollens, mites, moulds, foods, insect venoms, pet allergens, cockroaches and more. The choice of allergen to be tested depends on the history of the illness the person has, the history of any reaction/s and the area in which the person lives. Some allergens are more common in coastal areas, others inland. People living in the country may require testing for moulds (grow in granaries and thatched roofs), mites that grow in vineyards rather than indoors, or specific trees in the area. People living near the sea may require testing for moulds (that can grow on seaweed). 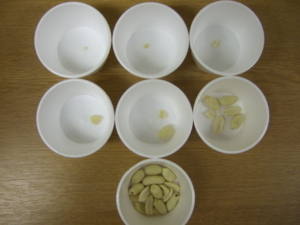 ImmunoCAP tests are also available for mixes of allergens, like lots of nuts all together, or lots of tree pollens or lots of moulds. These can be used to screen for allergy to a group of allergens, rather than a specific allergen. Two commonly used screening tests are the food mix (containing egg, milk, peanut, fish, soya and wheat) and the breathed-in (aero) allergen mix (Phadiatop) which contains many allergens including mites, pollens, moulds and pets. If these are reactive, it may be useful to do the tests for the individual allergens to see which actual allergen you are sensitised to. This can often be done on the same blood sample without another needle-prick. Allergens are usually very big proteins. Some parts of the protein cause more severe allergies than other parts of the protein. Newer ImmunoCAP “component” tests can look for specific parts of the allergy protein and indicate whether the allergy is more likely to be severe, less likely to go away or more likely to be a “real” allergy rather than just an “innocent” sensitisation. Commonly used component tests are used for milk allergy (casein), peanut allergy (Ara h2), Egg allergy (ovomucoid), wheat allergy (omega 5 gliadin), hazelnut allergy (Cor a8), soya allergy (Gly m5), bee allergy (Api m1 and Api m10) and wasp allergy (Ves v1 and Ves v5). Testing for delayed type reactions. Tests for delayed type allergy include blood tests (CAST, MELISA or BAT) and skin patch testing. These tests are highly specialised and usually used only rarely by general doctors. These are not “absolute” tests for allergic reactions and need to be interpreted with care. In cases which are uncertain, the allergist may recommend a challenge test. For immediate type reactions a controlled incremental challenge test is done. This is when we give small then larger doses of the allergen to the person at 15 minute intervals in a controlled setting usually in a clinic or hospital. This can be done for foods (see oral food challenge tests) and medicines but is not done for insect allergy. For delayed type allergies proof of a specific allergen causing symptoms relies on removing that allergen for a few weeks … if symptoms go away it is then critical to “re-challenge” the person with allergen to prove that symptoms come back. An “elimination-challenge” test is NOT the same as a challenge test done for immediate type reactions. There is absolutely no evidence that ALCAT, Vega testing, pulse testing or kinesiology are of any benefit in diagnosing food allergy. People who use these tests may spend a lot of money to receive an incorrect list of allergens to avoid and risk their health and/or nutrition.